We are no strangers to either seizures or epilepsy, since my husband has had epilepsy since childhood. So you would think we would have realised immediately that epilepsy was what Harpsie was suffering from, but this was simply not the case. He did not initially present with seizures, as I would have expected - they came later. Rather, Harpsie was diagnosed with epilepsy after a scary week of him exhibiting increasingly strange behaviour, hospitalisation, and tests for a suspected brain tumour (meningioma). He fooled ten different vets at a specialist veterinary hospital before we finally received the correct diagnosis. You can read more about our scary experiences here. A seizure is a sudden change in behaviour caused by temporary changes in the electrical impulses that occur in everyone's brain. According to my husband's neurologist, since everybody has these electrical impulses in their brains, in the right circumstances anybody could have a seizure. However, in practice they are relatively rare in humans and even more so in cats - it is estimated that less than 1% of cats experience seizures (and trust Harpsie to want to join such an exclusive club). Seizures are not a disease in themselves, but rather are a symptom of another problem. Seizures are seen relatively often in cats with chronic renal failure, for example, and for a number of different reasons, such as hypertension or calcium imbalances. Tanya's Feline Chronic Renal Failure Information Centre has more information on these causes and treatments. Seizures of this nature, caused by metabolic problems or other problems outside the brain itself, are sometimes called reactive seizures. Other causes in cats without renal failure include infections (the most common cause for animals aged less than 12 months), liver disease, low blood sugar or poisons. The use of Reglan (metoclopramide) for stomach problems may lower the seizure threshold. Certain flea treatments can also be a problem. In Seizure disorders in dogs and cats, Dr RM Clemmons from The Neurology Service at the University of Florida's Veterinary Medical Teaching Hospital mentions that the flea treatments Advantage and Program "appear to lower the seizure threshold and make seizure disorders more difficult to control", so I would not use them on a cat who has had a seizure or who is at risk of seizures. If your cat has his/her first seizure shortly after using one of these medications, speak to your vet and do not use the product again. The vet should report the adverse reaction to the appropriate authorities. The most common cause of seizures in animals over the age of five is a brain tumour known as a meningioma - this is what Harpsie was initially thought to have. Seizures caused by a problem within the brain are called secondary seizures. Epilepsy is simply the name given to recurring seizures for which no cause can be found. So in a sense it is a negative diagnosis. Harpsie was diagnosed with epilepsy when no other cause for his seizures could be found. You can read about his seizure and epilepsy journey below. Seizures for which a cause cannot be found are called primary seizures. generalised seizures, where both sides of the brain are involved. With these seizures there will be loss of consciousness. This type of seizure was previously known as grand mal. These are the most common seizures in cats. partial seizures, where only part of the brain is involved. With these seizures there is no loss of consciousness. This type of seizure was previously known as petit mal. psychomotor seizures are a type of seizure seen only in animals. These may involve involuntary snapping, circling and other behavioural changes. For information on cluster seizures and status epilepticus, see When is a Seizure an Emergency? the post-ictal period, i.e. the period after the seizure. There is also the inter-ictal period, i.e. the length of time between seizures. What happens during a seizure depends upon the type of seizure. The cat may become unconscious or confused, may appear rigid, and may exhibit increased movements, such as jerking and/or twitching. However, not all seizures are like this - our Karma had a seizure in which she went limp and her eyes were rolling in the back of her head. Humans sometimes know shortly beforehand that they are about to have a seizure, which is known as an aura (my husband usually does, he feels like he is entering a tunnel but he cannot speak at this point). Cats may know too - they may start pacing or acting in a restless way, but equally there may be no warning signs. After a seizure, the cat may be very tired and want to sleep, but some cats become very hungry immediately after a seizure. Epilepsy.com is a human site with information on the types of sensation and behaviour which may be felt and seen in humans during the three phases of a seizure. Often by the time the cat is examined by a vet after a seizure, everything is back to normal, so many vets diagnose seizures from the client's description of what they witnessed. It is therefore very important that you try to watch any seizure closely, and be able to describe it as accurately as possible. Be sure to time it, and if at all possible, videotape it (but do not leave your cat unattended purely so you can fetch the camera). Bloodwork will be checked to see if there is an obvious cause for the seizure, e.g. abnormal potassium levels. Ideally blood pressure should also be checked because hypertension is a relatively common cause of seizures in cats. Your vet may also do some neurological tests - these will definitely be done if you see a neurologist - but these are not invasive, they test reflexes, vision etc. If bloodwork and other tests are normal, then the vet may simply say it was a seizure and recommend doing nothing further at this stage other than waiting to see if it happens again - this is what our vet recommended when our Karma had a seizure in June 2006 (which fortunately appears to have been a one off). However, I've heard from some people whose vets have immediately diagnosed epilepsy and placed cats on medication after only one seizure. This seems like overkill to me, epilepsy medications are powerful drugs with the potential for a number of side effects, and they should therefore only be used if they are essential. However, if seizures occur more than once a month with no obvious cause such as hypertension, a vet may recommend trying anti-seizure medications to see if they help. If a meningioma (a type of brain tumour) is suspected, then you may need an MRI scan and possibly a spinal tap in order to narrow down the likely cause. This is expensive (US$1200-1500 in the USA) and requires general anaesthesia, so is not used routinely for most cats with seizures. We did opt to have an MRI scan performed on Harpsie because the vets thought he had a meningioma, and we needed to know its size etc. so it could be determined how to best treat it. However, Harpsie's MRI scan was basically normal, so epilepsy, which as mentioned above is essentially a negative diagnosis, was deemed by his neurologist to be the cause of his seizures. If the cause of a seizure is known, e.g. hypertension, then treating the cause will resolve the problem, and seizures should not recur. In other cases, most vets will opt to treat if seizures occur more than once every 4-6 weeks. For cats with recurrent seizures and/or epilepsy, the primary treatment is a drug called phenobarbital, commonly abbreviated as phenobarb. The goal is not to cure the seizures, but to try to control them. Since Harpsie was in such a bad way after his two seizures, he began on this treatment. Phenobarbital is prescribed in grains, which is rather confusing. A grain is around 65mg, and Harpsie was prescribed a quarter grain (16.2mg) twice a day. 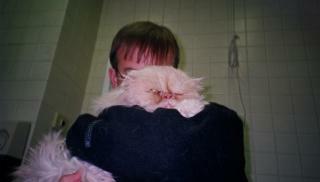 The exact dose depends upon the cat's weight and the severity of the seizures. You should not skip a dose even if your cat appears well, because a seizure could occur. It takes 2-4 weeks for phenobarb to reach the required level in the body, so the cat is at increased risk of seizures during this period. Phenobarb is extremely sedating, and may also lead to "the three Ps": polyuria (increased urination), polydipsia (increased drinking) and polyphagia (increased appetite/eating). Phenobarb may also affect the liver, so liver values should be checked at regular intervals (every 6-12 months) via a bile acids test. Occasionally phenobarb may also cause anaemia. If you ever stop using phenobarb for some reason, you must not do so suddenly. It is essential to taper the dose down gradually. Unfortunately in rare cases phenobarb toxicity occurs. 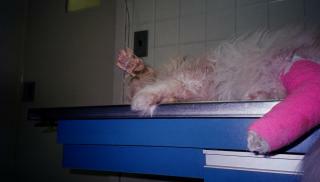 Harpsie went through a crisis in February 2006, when he had been on phenobarb for 17 months. He exhibited heavy breathing, anaemia and extremely severe constipation. His liver values were also off. The neurologist suspected phenobarb toxicity. He halved Harpsie's dose of phenobarb (through tapering, not overnight), and he improved greatly, whilst remaining seizure-free. Mar Vista Vet has a good overview of phenobarbital. Drs Foster and Smith provide a summary of phenobarbital. Potassium bromide is an old treatment for seizures that was discontinued when phenobarb became available. It may actually work better in cats, but since it is no longer used in humans, it is now only produced by chemical companies rather than by pharmaceutical ones. It is still sometimes used in dogs, and may occasionally be used for cats who do not tolerate phenobarbital or whose seizures are not properly controlled by it. In the latter case, phenobarbital and potassium bromide may be used concurrently. Mar Vista Vet has some information about potassium bromide. This is commonly given in order to stop seizures when they begin. 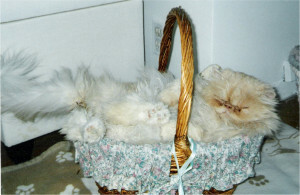 It is particularly important for cats who are prone to cluster seizures. Many people who have cats with cluster seizures keep diazepam suppositories at home to use on their cat in case of emergency. Some vets are using diazepam to control seizures on an ongoing basis, but since diazepam can cause liver failure in a small number of cats, it is probably safer to use it only to stop seizures that have begun. It was used on Harpsie in this way when he had his seizures in the hospital. Fulminant hepatic failure associated with oral administration of diazepam in 11 cats (1996) Center SA, Elston TH, Rowland PH et al. Journal of the American Veterinary Medical Association 209 pp618-25 reports on the risks of using diazepam in cats, and concludes that some cats have an idiopathic (i.e. the precise reason is unknown) response to this drug. Some cats just appear to be sensitive to it, and it is hard to know beforehand which cats would react in this way. Mar Vista Vet has more information on using diazepam in cats. Even if medications are used, it is impossible to control seizures with medication in about 30% of cats. In these cases, acupuncture may be of use - Harpsie's neurologist is a trained acupuncturist for this reason. You can read more about veterinary acupuncture here. the cat has a seizure lasting for five minutes or longer or repeated seizures where the cat does not fully regain consciousness between seizures ("status epilepticus"). Seizure disorders in dogs and cats is a paper by Dr RM Hardy of the University of Minnesota College of Veterinary Medicine which discusses these types of emergency. Your cat will probably need to be put on intravenous anti-seizure medication (usually diazepam initially) for status epilepticus. Some people are able to manage cluster seizures at home by using diazepam given rectally, but the first time cluster seizures occur, you should to go to the vet quickly. Management of status epilepticus in the dog and cat (2007) Cochrane SM Presentation to the World Small Animal Veterinary Association World Congress 2007 discusses how to treat status epilepticus. Updates on seizure management (2001) is a presentation by Karen Kline to the Atlantic Coast Veterinary Conference. University of Florida Veterinary Medical Teaching Hospital has a helpful paper about epilepsy in dogs and cats. The diagnostic and therapeutic approach to recurrent seizures in the cat (2004) is a presentation by Dr J Parent to the 2004 World Small Animal Veterinary Association World Congress. Washington State University College of Veterinary Medicine has some information about seizures. Mar Vista Vet has a very helpful overview of epilepsy in dogs and cats. Bruce Lowekamp's Page is a good summary of seizures and epilepsy in cats. 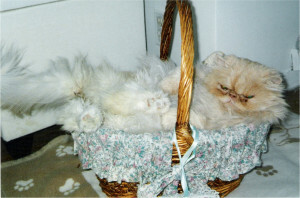 Epi Felines is a support group for people with a cat who has seizures of any type. Harpsie did not present with epilepsy in a typical fashion, though some of what we saw was actually typical of epilepsy, though we were not aware of that at the time (I have no idea why the vets did not realise though). The problems began on a Monday in mid October 2004. They occurred about three weeks after Harpsie's problems with his dental and resulting torn trachea, so initially we assumed that the signs and symptoms we were seeing were somehow related to that. There may in fact have been some connection (at least one of Harpsie's ologists thinks there probably was) but we still don't know what. 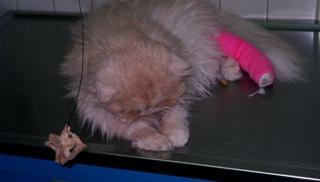 Harpsie had some vomiting and diarrhoea on the Monday, and did not eat all day, he simply slept. The next day he seemed to be much better, he was no longer sick and he ate of his own volition, although he was very vocal, and would wander around howling at intervals, which was not usual for him. 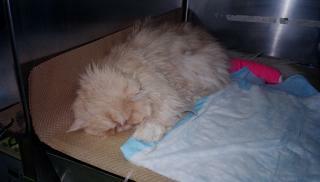 On the Wednesday, he again was subdued and slept all day, and did not eat. I spoke to the vet dentist who asked various questions, and we agreed that if Harpsie's appetite didn't improve by Friday, he would see him then. Things began to deteriorate on the Thursday. Harpsie seemed very restless, he kept wandering around howling. He has always liked to sit and tap the coffee table with one of his front paws. He would lie there and stretch out his leg, and you would hear as his claws occasionally and slowly tapped the wood. However, on this day he was doing this in a very fast manner, and almost obsessively, when he wasn't wandering around howling. But I got Cat Dancer out for Indie and he came to play too. He also played with a tissue I dropped. So he did seem normal in some ways, but I spoke to the vet dentist who agreed he should see Harpsie that afternoon. On the way there I noticed Harpsie was breathing very fast. This was a new and sudden development, and I was very worried. The hospital determined that Harpsie's mouth was fine and had healed beautifully. But he had a low temperature and they didn't like the new fast breathing. Blood was taken, but results would not be available until the following day, although in-house BUN was normal. His PCV (measure of anaemia) was low normal. The cardiologist checked him out and his heart seemed fine, with no fluid in the lungs. However, Harpsie's lungs were over-inflated, so the hospital suspected some kind of asthma crisis. 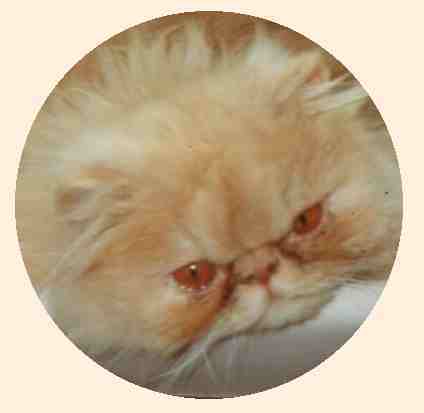 Although we knew Harpsie had asthma, this was his first asthmatic crisis. The vet also thought something else may be going on, he suspected CRF, but he said he would not know for sure until he received the bloodwork results back the next day. The hospital changed Harpsie's asthma medication from Millophyline-V (etamiphylline) to Brethine (terbutaline), and said I could leave him there or take him home. Since Harpsie becomes stressed at the vet's, I opted to take him home, but promised to return to the hospital if his breathing worsened. Harpsie ate a little when we returned home, and his breathing improved somewhat, though he was extremely subdued. On the Friday morning Harpsie was breathing normally but remained subdued. The vet rang at lunchtime and all the bloodwork was fine as was the urinalysis, so he said at present they could find nothing wrong other than the asthma. He wanted me to continue with the new asthma medication and see how Harpsie did. That afternoon Harpsie's breathing seemed to be becoming faster. Then he began to move about as if he couldn't get comfortable and howl, so I took him back to the hospital as an emergency. I really thought he'd stopped breathing in the taxi, it was so scary. When they checked him, they ascertained that his respiration rate (which should be 30-40 pm) was 100. They put him on oxygen and after about 40 mins they came to say that he was stable. This vet, like the vets on Thursday, felt something else in addition to an asthma attack might be going on but he also didn't know what it might be. He mentioned cancer but nothing showed on the chest x-ray. Harpsie remained in hospital being cared for by the cardiology team initially, pending examination by the respiratory medicine team on Sunday. The hospital called me on Saturday morning to tell me Harpsie had just had a seizure (at 10 a.m.) He apparently recovered from it without help, but they had immediately given him diazepam (Valium) and moved him to intensive care for closer monitoring. His blood pressure, which had previously been normal, was too high (175) following the seizure, so he had also been given amlodipine (Norvasc), a medication for hypertension. Harpsie's breathing was still too fast at 80 rpm, both before and after the seizure, however an ECG was normal. The hospital vets were now convinced that something else was going on either instead of or in addition to the asthma attack, but they still did not know what. They had basically ruled out heart disease (Harpsie was under the care of the cardiac team at this time, and they had seen none of the signs they would expect with heart disease). They asked if they could run bile acid tests to check Harpsie's liver function, since some types of liver disease can cause neurological signs, but the results would not be available for 24 hours. I was asked if I would like to have Harpsie's lungs examined under anaesthesia, but I declined because I was not sure he could survive it, so instead they started him on antibiotics in case the lung infection he had had a few weeks earlier was part of the problem. Besides, this was just a guess they were making. They had already told me that if the liver results were normal, then all the signs pointed to a brain tumour, but that an MRI scan under anaesthesia would be necessary to confirm this, and I was not sure that Harpsie could survive that either. We visited Harpsie on the Saturday afternoon. It was utterly dreadful. He was like a zombie and did not seem to recognise us at all. In fact, he appeared to be blind. In the photo on the left he is in the intensive care unit. At intervals he would let out truly harrowing howls, like a wolf, which the vet said had been happening intermittently ever since the seizure. He also hissed once. His left front leg kept twitching and jerking, a little like his usual tapping of the coffee table. His basic functions were apparently still intact though, he was still eating and drinking and using his litter tray. It was as if he had been reduced to the most basic functions for survival. The vet told us that Harpsie's heart rate had speeded up at one point before we arrived but his new asthma meds could be the cause of that, so they had stopped them and his heart rate had returned to normal. The vet had pushed for the liver test results and they had actually come back: liver function was normal. They had had a critical care team meeting about Harpsie and they had ruled out most things now. Basically they felt it was either some kind of infection or FIP or, most likely, a brain tumour, in particular a type of brain tumour called a meningioma. This would explain the seizure, howling etc. The hospital could give Harpsie an MRI scan on the Monday but it would require lengthy anaesthesia which carried risk. But by now it was the only way to know what was going on. The worst was when we were leaving, and I didn't want to let go of Harpsie, not knowing if I'll ever get to cuddle him again, and as we walked out, the vet said he was sorry but he had to ask us what we wanted him to do if Harpsie needed resuscitating. Harpsie looked so ill that we said no, and left sobbing. On Sunday morning I spoke to a new vet (they had changed shifts) and he said Harpsie was the same as the previous day, though no more seizures at least. We were of course thrilled Harpsie had made it through the night, but we were very depressed, because he had looked so sick the previous day, and we had really been hoping that he would have improved. In fact, when we visited Harpsie we were actually pleasantly surprised. The previous day we had to go and visit him in ICU but this time, whilst he was still a patient in ICU, the vet brought him out to us since he was currently seizure-free. Every time during this period that a vet or vet tech had carried Harpsie out to us in the waiting room (once on Thurs, once on Friday, once on Sunday), everyone said "aahh" because he's just so cute. We weren't expecting to have him come to us this time, so it was so good to see he was up to leaving ICU and making people smile as usual. Harpsie sat on the table and he had definitely improved. His breathing was about normal. He was apparently eating a/d by himself, albeit with the aid of an appetite stimulant. He was much more alert, and whilst he was not himself, we were sure he knew who we were (the vet thought he did too). The absolute best moment was when we got out Cat Dancer, which we'd taken along just in case. He actually played with it! We were so choked up. He was still jerking his left front leg a lot but this wasn't like that, he was definitely watching Cat Dancer and swiping at it, the vet agreed he had that level of co-ordination. The fact that he had also had no more seizures was a good sign according to the vet, as was the fact that he had improved. But things could still change quickly, and he still appeared blind, even though he could obviously see Cat Dancer. The critical care team were fairly sure that the most likely explanation for his behaviour was a brain tumour. They did not think it was heartworm. It is hard to describe the subtle neurological changes but they were there. Harpsie was not quite himself, it was apparent even to our untrained eye that something else was going on. The vets told us the symptoms were very typical of front of brain changes. We had to make some tough decisions. If it was a brain tumour, we needed to know so we could commence treatment if possible. The longer we left things, the greater the chance Harpsie would worsen. We were wondering whether to take Harpsie to see a neurologist. Unfortunately there wasn't one at the hospital. The hospital was happy to give us a referral, but the neurologist only visited the city one day a week, and we would have to take Harpsie in a taxi from the hospital to see him and he might have a seizure en route. We nervously scheduled an MRI scan and spinal tap for the following morning at the hospital. Harpsie was the first patient scheduled though emergencies would jump the queue. We were told the actual scan and tap should be fine, the risk was the anesthesia. Anaesthesia is a bigger risk than normal if there is a brain problem, and the MRI and spinal tap procedure is quite long (1.5 hours). But we didn't feel we had much choice. We could not leave Harpsie the way he was long term. It was a really tough decision, but having seen how he was fighting and trying to help himself, we had to give him that chance. Depending upon the results, we might then take him to see the neurologist (or at least take the scans), or we might just commence treatment at the hospital if a tumour was confirmed. If Harpsie did have a brain tumour, it might be untreatable, depending upon where it was. However, if it was the most common form of brain tumour in cats (at the front of the brain and called a meningioma), then he might simply need a three week course of daily outpatient radiation therapy (which cats normally handle well), and then it would be sorted. There is nothing really going on in the front of the brain, so treating it would not cause brain damage of any kind or affect his senses. Many cats who have this type of tumour go on to live for several years, so we felt we have to give Harpsie a chance by at least finding out what is going on. We were praying he did not die on the operating table but if he did, at least he wouldn't know anything about it. We just prayed we were making the right decision. The vet called in the morning to say Harpsie appeared stable, and in fact was being a little feisty, so they felt he could tolerate the MRI scan, though it had been postponed because of more critical cases. It was to be performed that afternoon. The vet called at about 4 p.m. to say Harpsie made it through the anesthesia. However, he was still pretty much out of it so he was placed in an oxygen tent for a couple of hours. They told us the longer Harpsie was out of it, the worse the prognosis. The MRI scan showed some changes in Harpsie's brain, but they were not sure what they were. It was not a simple meningioma where they could recognise it immediately. It might still be a meningioma but they needed an expert oncologist to take a look at the results. Unfortunately they used somebody over in Colorado and we might not get his opinion until Wednesday. This seemed ridiculous to me, so I went online and discovered that although the local neurologist is only in New York City one day a week, that day is Tuesday. I therefore made an appointment for Harpsie the following evening. I did not know if he could help, but it had to be worth a try. We went to see Harpsie that evening. He had improved so much that he was not only out of the oxygen tent, he was even able to leave ICU and come and visit us once again. He was alert and recognised us, but we only stayed for 20 minutes because he was obviously very tired. The bad news was, we were told Harpsie had had another seizure at 5.30 a.m. that day! The person who saw it wrote it in the back of Harpsie's notes for some reason, so the vet did not realise until we went in to see Harpsie that evening. Whilst this lack of communication was worrying, I was actually rather relieved that I had not known about the seizure before the MRI scan was performed. Week 2, Tuesday 26 October - A Diagnosis! The oncologist called in the morning to say Harpsie was doing well right now. He was eating without the aid of an appetite stimulant, grooming himself afterwards and using his litter tray. He was still very quiet but hopefully that would improve. She said the spinal tap showed none of the cancer cells that they would normally expect to see if it was a meningioma. She was therefore wondering if Harpsie possibly had something like a stroke, or an idiopathic episode of some kind with no clear cause. If so, he was recovering well from it, but they could give him meds to reduce the risk of it happening again. In the evening we collected Harpsie from the hospital and took him to see the neurologist. When we went to collect Harpsie from the hospital, the vet on duty told me they thought Harpsie was now blind because he had a negative menace test (essentially, you move your hand towards the cat's eyes and see if there was a reaction; there was none in Harpsie's case). We thought this must be because of the seizure the previous day, because he had definitely played with Cat Dancer on the Sunday. We were so upset. They brought Harpsie out to us and he did seem to be more or less blind and really in his own little world. In the taxi he began to howl a bit and twitch, so we were petrified that he might have a seizure. When we arrived at the neurologist's, we sat and waited and began to think Harpsie was also deaf, because he didn't seem to react to a dog barking near him. He was unsettled and restless too. By this time I was a big, sobbing heaving mess in the waiting room. We wondered if we should be considering euthanasia, but he was eating, grooming, using his litter tray. We took Harpsie out of his basket and he immediately calmed down and slept snuggled up on each of us in turn. He seemed peaceful, and didn't really twitch. When he was resting like that, we felt he wasn't in pain. He did open one eye later on when another dog barked, so we thought perhaps he wasn't deaf. The neurologist asked me to describe events, and then examined Harpsie. I asked him if he thought Harpsie was blind, and he said no, he definitely had at least some vision. He put Harpsie on the floor and he could walk, though he sort of veered to one side. Then he examined the MRI scan, turned to us and said "this MRI shows a normal brain". It was not cancer! Basically, the neurologist believed that Harpsie had late onset (in terms of age) epilepsy. He actually thought Harpsie has been having one long seizure of varying intensity since the previous Thursday. The fact that Harpsie came out of the two big seizures by himself (to a degree) without intervention, and the fact that he survived the anaesthesia, were good signs. He said "I think I would probably be described as an optimist, because I like to expect positive results unless there is a good reason to think otherwise, and in this case, there is no good reason"! He started Harpsie immediately on IV phenobarbital (Harpsie still had the IV catheter in, in case he needed to return to the hospital). We were told to continue with the phenobarb for 10 days, and he thought the chances were excellent that Harpsie would return to his old self!!!! We were told to be prepared for him to become very quiet because the phenobarb is very sedating, but hopefully his body would adjust. If he stopped eating while his body adjusted, he would have to return to the hospital and be an in-patient. But with luck and time, Harpsie would return to normal. We were told there was still a risk of seizures whilst we get the drug built up to the correct level in Harpsie's body, and it was possible that a seizure could be fatal, so Harpsie was not out of the woods yet. The neurologist said he sees seizures every day, and there are no guarantees, but the fact that Harpsie came out of the big ones by himself was encouraging. Even if he were in hospital, they couldn't necessarily control them (apparently they cannot control 30% of seizures in cats). So he said take him home and try to think positive. He said he would re-assess Harpsie in two weeks. When we arrived home, Harpsie promptly ate half a can of Hill's a/d and then sat on my husband's knee. Things were a bit up and down. The good news was, Harpsie continued to eat well, and his twitches and jerks had more or less stopped now he was on the phenobarb (none at all yesterday, only five mins today). He also seemed to be more aware of things around him, whereas he was in a bit of a fog before. He could definitely see! He slept peacefully through the night for seven hours last night. The bad news was, he was a bit howly and clingy today, and seemed unsettled unless one of us was holding him. He was also exhibiting some degree of incontinence. He partly hit the litter tray on Tuesday, partly missed it, but he definitely missed it yesterday and actually peed all over my husband and our bed today. He was able to walk, but it was taking him time to get on his feet, so perhaps he was simply not getting there in time, we were not sure. He also hadn't pooped since he came home 48 hours earlier, despite eating mountains of food. Harpsie's breathing was fast occasionally but if I took him in my arms, it became normal again. When he was being held by us, he just slept and looked very relaxed. The neurologist did say it would take the meds two weeks to kick in properly, so we did feel we have to give Harpsie a chance; after all, he was not in pain, and there was some improvement. Harpsie seemed a little better today. There was no twitching, he slept through the night, was walking a little better, seemed more "with it", though still very tired. Best of all, he pooped! Only a little bit, not enough considering how much he'd been eating (three plates of food by 10 a.m.) but it was a start. We agreed we would collect lactulose from the vet's to keep the constipation under control. Harpsie was more constipated today despite being on the Lactulose, he pooped and then immediately vomited which is a classic sign of constipation in cats, so we increased the Lactulose dose. Harpsie was pretty stable. He was sleeping all day but at least he had not had any more seizures. He would eat if I took food to him (and occasionally he would get up and look for food). He washed his paws after eating, and he played with Cat Dancer without actually getting up from his bed. He was pooping OKish now, We could certainly see the old Harpsie, but there were still a few changes. He hadn't purred for ages, for example, and Harpsie can purr for Britain normally. Plus we were not getting bossed about, so we felt lost without our leader telling us what to do (-; We were due to see the neurologist next Tues, who would adjust the meds if required. I was hoping we would be able to reduce the dose so Harpsie could return to his old bossy, purring self. But I must say, the medication was working miracles overall. I still shudder to think how sick Harpsie had been and how the doctor had even asked for resuscitation instructions! We saw the neurologist for our follow-up appointment this evening. While I was getting ready to go there, Harpsie sat on my husband's knee; and he purred!! This was the first purr in 2.5 weeks so we were absolutely thrilled. The neurologist was pleased with Harpsie's progress overall. He took blood to check the phenobarb levels, which would determine if the dose needed adjusting. Harpsie was still at risk for seizures until the medication is at optimal levels, but we figured every day without one was a bonus. He also weighed Harpsie and he had lost 6 oz which was a worry, because he had been eating quite well. We said we would monitor his weight and encourage him to eat more. Unfortunately, the phenobarb was having a few unwelcome side effects, basically slowing down some of Harpsie's other functions. One was the constipation - we were to continue with the lactulose and SEB. The other, potentially more worrying one, was the effect on Harpsie's bladder, which was getting sluggish. Harpsie only ever peed once a day, but last week he once went 36 hours without peeing. This week he went 46 hours! I was actually on the phone to the vet's this morning to say I was bringing Harpsie in immediately because of this when my husband came running in to say Harpsie had just peed. He was not blocked, when he peed, he peed plenty; but it was a worry. The neurologist took a urine sample because all this urine sitting around inside Harpsie increased the risk of a urinary tract infection, but I doubted they would manage to culture anything, nothing had ever grown in the past, even when Harpsie had had kidney infections. He also gave me a drug to help relax the bladder muscles called phenoxybenzamine, we were to give one 2.5mg capsule twice daily if needed. The neurologist called, and Harpsie's phenobarb levels were at 20, with a range of 15 - 40. He therefore was happy with the current dosage, and did not want to decrease the dose as I was hoping. It was a rather depressing phone call. He said the fact that Harpsie's level was on the low side was a good thing, because it gave us room to manoeuvre if necessary. I asked him what he meant, and it turned out that being on the med didn't necessarily mean Harpsie wouldn't have more seizures. In fact, he would be happy if Harpsie were to have seizures every 4 - 6 weeks but if he had them any more frequently, he would want to up his dose. Harpsie hadn't had a seizure for three weeks by this point but I really hated leaving him even for an hour. I guess I still hadn't got used to this, though I shouldn't have found it that hard really because my husband has epilepsy too. Harpsie himself was OKish but not 100%. He basically was sleeping all day and all night, hence my unfulfilled hope that we might be able to reduce the dose. I didn't think he was unhappy, but I didn't know if he was actually happy either. I hope he was. He purred once last Tuesday evening but no purrs otherwise for 3.5 weeks. He was eating some but not enough because he was sleeping so much, so I kept taking food to him to try to get him to eat (he did always eat a little of whatever I take to him). He had lost a bit of weight, 6 oz in two weeks. Thank goodness he was a little plump before, we always like him to have love handles for occasions such as this! He had been peeing OKish, not as much as he used to, but it was not a lot less now and at least he was going daily again which is typical for him. He didn't have a urinary tract infection, I did try the increased urination pill for two days, and it had no effect whatsoever, so I stopped it. Harpsie was still constipated unless he got Slippery Elm Bark and lactulose, and even with them he was not going as often as I'd like. The one good thing, that made me think he might still be enjoying life, was Cat Dancer. Thank God for that toy! He didn't move about to chase it, but he would lie in bed and play with it that way. And he wasn't hiding, he was usually lying next to me on the sofa, snoring away. Harpsie remained on phenobarb for the rest of his life, and had no more seizures. He did have a near miss at Christmas 2005 because I forgot to give him his phenobarb before flying home for Christmas. You can read about how British Airways saved his life here. Harpsie did develop what the vet thought was phenobarb toxicity three months before he died, so the vet halved his phenobarb dose. You can read more about what happened at that time here. Harpsie's blood level fell to 12 after we reduced his phenobarb dose, so it was below the therapeutic range of 15-40, but he never had another seizure. Meningiomas are the most common type of brain tumour found in cats. As described above, it was thought that Harpsie had a meningioma, until an MRI scan proved otherwise. Symptoms of a meningioma include seizures, walking strangely (like a drunk), blindness, and sometimes pressing the head against objects. A vet may suspect a meningioma based on signs and symptoms, but normally an MRI scan is necessary for definitive diagnosis. Meningiomas are most common in male cats over the age of 10 for some reason. In most cases, a meningioma is not necessarily an immediate death sentence for the cat. This is because, firstly a meningioma is benign (i.e. not cancerous); and secondly, because it is usually a stand alone tumour at the front of the brain which can normally be surgically removed without major problems. There is nothing really going on in the front of the brain, so treating it does not normally cause brain damage of any kind or affect the cat's senses. We were told that if you have a meningioma removed and opt for radiation therapy, the cat normally survives a year. 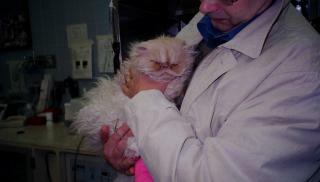 If you throw chemotherapy into the mix, the cat usually survives two years. If you opt for less invasive treatment, such as steroids, the cat may survive for up to six months. Diagnosis and treatment of brain tumors (2002) is a presentation by Dr WA Lecouteur to the World Small Animal Veterinary Association World Congress 2002. Mar Vista Vet provides more detailed information about meningiomas. Brain tumours in cats: is MRI useful? (2004) is an article by DVM Magazine. Fairfield Veterinary Centre tells the story of a young cat called Tommy whose meningioma was successfully treated. It includes a scan showing the meningioma. Advanced Veterinary Medical Imaging has MRI scan slides showing a meningioma. Skribbles' Story tells of one cat who survived 2.5 years with a meningioma.